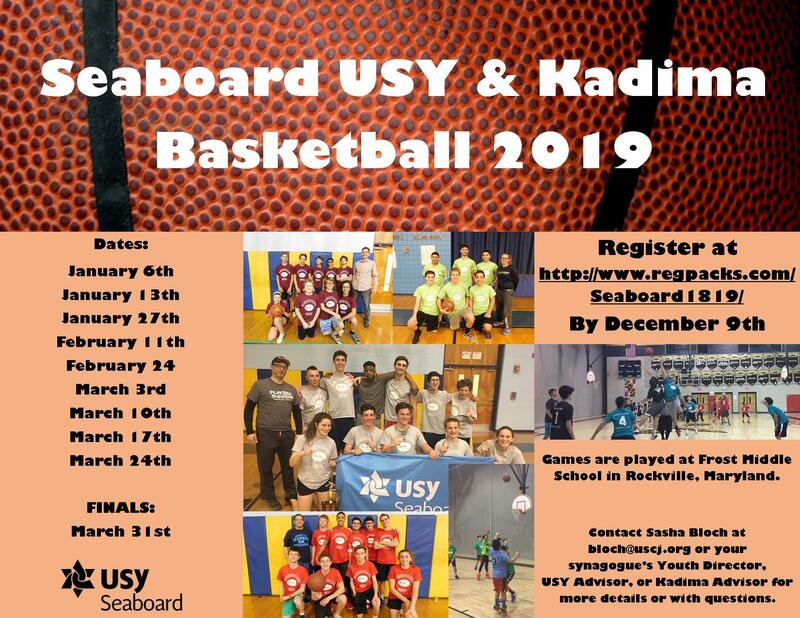 Registration is NOW OPEN for Seaboard USY & Kadima Basketball 2019!!! There are separate leagues for USY teams (9th-12th graders) and Kadima teams (6th-8th grades), and teams are coed. Games begin Sunday night, January 6th and continue on most Sunday evenings through the end of March. All regular season games are played at Frost Middle School in Rockville. Most teams are by synagogue but your synagogue does NOT need its own team for you to participate!! Registration is easy and entirely online!!! Step 1: Contact your Youth Director/Advisor in your synagogue to reserve a spot on a team. If your synagogue isn’t putting together a team, reach out to Sasha in the Seaboard Office for more information. Step 2: Once you have reserved a spot on a team and have made sure you are a paid member of USY/Kadima, log onto http://www.regpacks.com/Seaboard1819/ to register for the league! If your synagogue has a team, you will automatically be assigned as a player on that team. If your synagogue does not have its own team, you will be assigned to a team in the league. Contact your synagogue or the Seaboard Regional Office with questions about cost. The deadline to reserve your spot on a team is Friday, December 9th. Looking forward to another INCREDIBLE year of Seaboard USY & Kadima basketball with you all!! !